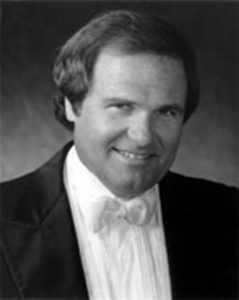 In the fall of 1979, the School of Music welcomed Wisconsin native, Craig J. Kirchhoff, as Ohio State’s fourth director of Bands. Kirchhoff received a bachelor of science in Music Education from the University of Wisconsin-Milwaukee and a master of music from the University of Wisconsin–Madison. Former band members and individuals who were previously involved with the program saw this as a demotion in former title for Concert Band alumni, as well as an unwanted change to a long-standing university tradition. Diplomatically choosing his battles, Kirchhoff maintained the name “Concert Band” for the large top ensemble, a title that would remain with the group until 1999. The Scarlet and Gray Buckeye Bands were renamed “Symphonic Band” and “University Band,” respectively, in 1979. Kirchhoff also founded the Wind Ensemble, the central concept of which was to place one player on each part, was organized from some of the finest instrumentalists in the School of Music and consisted of approximately forty graduate and undergraduate members, performing wind literature from the Classical period through the twentieth century. The Wind Ensemble frequently appeared in concerts with the Concert Band, with some students serving in both groups. The Concert Band performed a mix of traditional and contemporary music, rehearsing five days a week and performing at least six concerts a year. In addition to joint concerts with the Wind Ensemble, the Concert Band also frequently collaborated with the Symphonic Band, the roster of which included a large percentage of music majors. Faculty who conducted the Symphonic Band on a regular basis from 1979 to 1993 were Robert Cochran (1979-1983), Jon Woods(1979-1981), Howard Meeker (1983-1984), Harvey Benstein (1984-1988), Craig Kirchhoff (1988-1989),Robert LeBlanc (1988-1989), and Richard Blatti (1989-1993). Directors of the University Band were all graduate assistants. With the hiring of Harvey Benstein in 1984, a full-time position was created with the title “Associate Director of Bands,” a position he held until 1989. Richard L. Blatti served in this role from 1989-2010. During Kirchhoff’s first two years at Ohio State, the bands had very active seasons. Special appearances were given by guest conductor, Karel Husa, in 1980, as well as Verne Reynolds, in 1981, for the premiere of his Concerto for Band. In 1981, the Symphonic Band traveled to Watkins Memorial High School in Pataskala, while the Wind Ensemble appeared at the OMEA Conference in Cleveland and the CBDNA Conference at the University of Michigan. Thirteen years after the Concert Band appeared in a Carnegie Hall debut with McGinnis, the current Concert Band gave a repeat performance of two previously programmed selections: Dahl’s Sinfonietta for Band, and Grainger’s Lincolnshire Posy, along with selections by Strauss, Holst, Schwantner, and Bernstein.